While trying to come up with an original idea for dressing up my two Havanese pups, I browsed the internet for ideas. I saw a Tootsie Roll costume, which led me down the “candy” path. 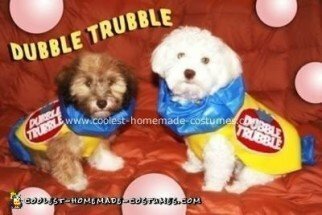 I came across a photo of a Dubble Bubble pillow and then thought of changing the name to Dubble Trubble since I have two dogs and they are a handful! I had no template or pattern and I am no professional when it comes to sewing. I purchased yellow fleece, a plastic-y blue material, a few sheets of colored felt (for the logo) and some scrapbooking foam letters. I started by making the four Dubble Trubble logos, one for each side of each dog. I cut four red ovals, four slightly larger white ovals and four blue crowns. I glued the red ovals to the white ovals, then placed the foam letters (which had sticky backs) and then loosely hand stitched the letters for security. I then measured my two dogs and loosely drew a simple pattern onto the yellow fleece (always better to start big and cut it down). It is just a two piece pattern (very simple), with cut outs for their legs. I then cut strips of blue fabric about 12 inches wide and ran a single loose stitch through both sides, pulling the fabric along the thread to create a gather on each side. I folded the fabric in half and stitched, then stitched a blue “ruffle/wrapper” to each end of the yellow fleece portion (one around the collar area, one for the tail to go through. I then stitched the logos to the fleece and glued on the blue crown pieces. Then I bribed my pups with treats so they would sit pretty for mama for a picture (this took just about as long as making the costumes!). Is it hard to make this costume and plan out the size of the dog?